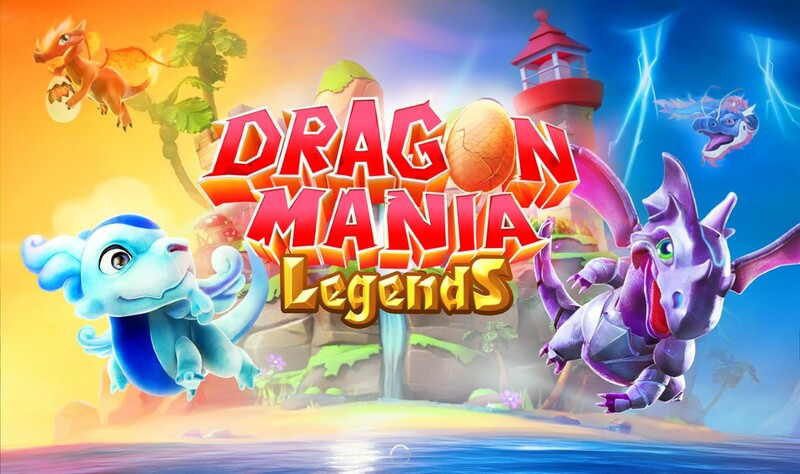 This guide is to give a broad picture of how to play Dragon Mania Legends in a way that will allow you to excel at the game and avoid the common pitfalls that can lead to frustration. Dragon Mania Legends is possible to play on many platforms. Windows, Windows Phone, Android, iOS, xBox. The first choice to be made when starting to play Dragon Mania Legends is which platform you will be playing on. While you can play on more than one platform, your accounts won’t be synced across the platforms. So you could have 1 account on Android and 1 on Windows, but they would be different accounts with different progress. If you have a choice of which device to use, choose Android. The reason for this is updates usually come first for Android, often even faster than for iOS, though they are pretty close. Windows (and Windows Phone/xBox) generally gets the new content after. Friends are very helpful in Dragon Mania Legends. The Portal Energy friends can send each other is worth a lot, as each one allows you to fight another time. While you are progressing through the fight map and getting new stars, this will be huge amounts of Gold, Food, and XP. Far more than the Gold or Food gifts. Always send Portal Energy to your friends! To get friends, join Dragon Mania Legends Facebook groups, and look for “add me” polls. You will only be able to see (and thus exchange gifts) with friends who are on the same platform (Windows, Android, iOS) and platform. Click on the “more” button next to the proper entry, and add those who have voted for your platform and server. Also vote so that other’s can find you as well. You can also find friends on our Friend page. If you get to a point you have enough friends, some polls will give you an option to select “I have enough friends” so you can move your vote away from your server and platform. You might want to consider setting up a “gaming” Facebook account for this purpose. That way you can keep your real life friends/family account separate from the hundreds or thousands of gaming friends. That way you won’t be spamming your real life friends/family with game requests. Dragon Mania Legends isn’t bad about this type of spam, but some games are. When you connect your game to Facebook you will get the Prairie dragon, which is likely to be your first “fight” dragon. So don’t wait to connect to Facebook! An important thing to know about DML is that all the hack sites out there are fakes. Don’t be tricked into giving hackers your Facebook login, or signing up for paid services/surveys. It’s just a waste of time and could really end up causing you a lot of problems and costing a lot of money. Even if you did find a way to hack the game, it’s likely going to end in your account being reset. Just play the game, it’s not that hard anyway. 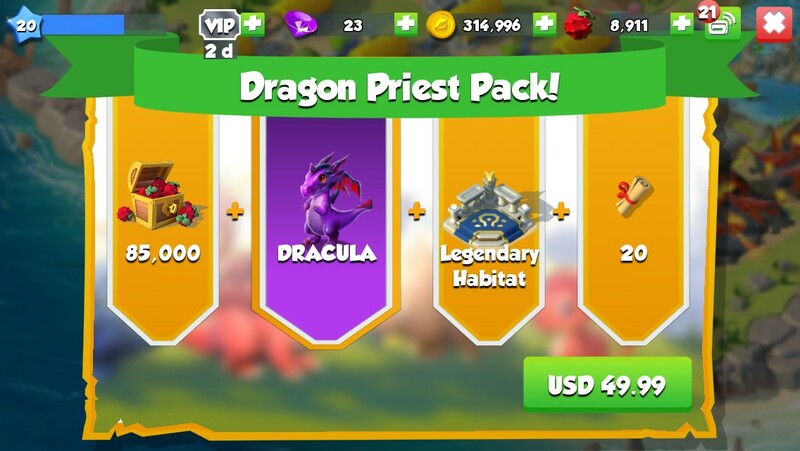 Dragon Mania Legends allows you to speed things up, and sometimes to get Dragons you can’t get otherwise, via purchases with real money or with Gems. You can of course play without using any real money, and do very well. You just won’t be able to get everything in the game, but none of what you are missing out on is required. 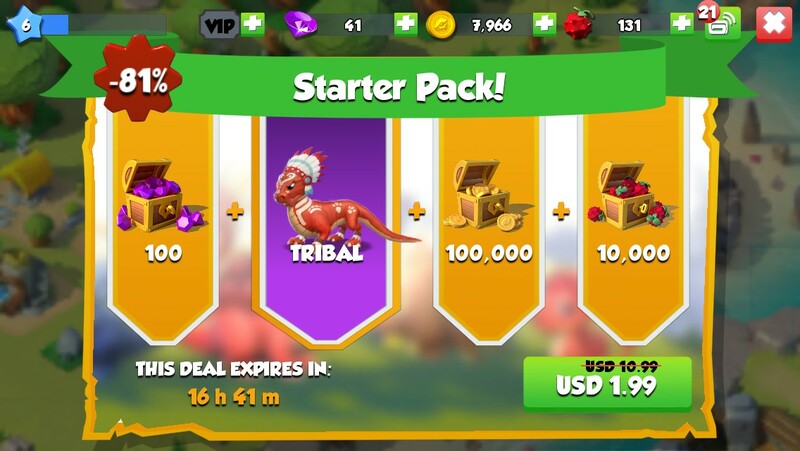 Buying the first starter pack (Tribal + Food) is one of the best deals in the game. It will help you get up to speed for a couple bucks, but isn’t a requirement. ALL THE OTHER PACKS SHOULD BE AVOIDED LIKE THE PLAGUE. They are not good deals. Usually they have dragons that can be gained other ways, and the Food/Gold are much better to buy other ways. If you are going to buy Gems, wait until there is a 2x sale. If you want to use Gems for Gold or Food, wait until there is a 2x sale. This way you will get ~4x the amount of Gold or Food for the same amount of money. Wait for VIP until you are higher level (30+) unless you’re very impatient. The bonus early isn’t much, but later on becomes very substantial. Also wait until there is a sale. Long term the cheapest Boss dragons are good buys. Short term they are not. Wait until there is a sale on the cheapest Boss dragons if you’re going to buy them. So in general: WAIT FOR A SALE before making any purchases! Don’t feel you have to make any purchases if you don’t want to. Like most games, Dragon Mania Legends starts out pretty slow. There are ways you can get around some of the waiting though. We’ve covered the “buy” option above. One of the main things to watch out for early on is clogging up your hatchery. Breeding times are faster than hatching times, and so you will find that you are often waiting for hatching your eggs you’ve bred/bought/won. For this reason, upgrading the Hatchery should generally be the first thing you do with Gems. Don’t speed up anything directly with Gems, it’s always a very bad deal! You should be able to upgrade the Hatchery rather quickly if you save your Gems. After that, save your Gems for upgrading the Hatchery again, upgrading the Portal, VIP, or Bosses. Buying Food on sales can be tempting, but only do it if you already have enough Gems to maintain VIP. Be aware of the potential breeding times from the combos you are breeding together. Use the breeding calculator to get familiar with what results you can expect. If you have long hatching times in the Hatchery, it’s a good time to try for long breeding times (eg. Epics) in the Breeding Cave. If you have short hatching times in your Hatchery, it may be better to get some of those quick to breed dragons out of the way first. Farming is a way to turn all that Gold you get into Food. For most players the rate of Gold income will be slower than the max rate of turning Gold to Food. So unless you are to the point where you have more Gold than you can spend, use the most efficient Gold:Food options you can handle the collection times on. Early on (and even up until very high levels) the amount of Gold you get from Habitats isn’t that much compared to how much Gold (and Food) you will get from fighting. It’s still important to max out your number of habitats and fill them with dragons, but don’t waste too many resources on upgrading your habitats early on. Or with levelling up your dragons for earnings. If you are running out of room, upgrade your habitats. Level 10 to 15 is enough for most dragons in regards to earnings. Until you can beat the entire fight map, there’s not much point in leveling up dragons further than that. Put your dragons in the best (in regards to how much Gold it can hold) habitat their elements allow. You only need 1 Fire habitat for instance, because the only dragon that has to go in a Fire habitat is the Fire dragon. The exception to this rule is when you have “spare” room like in the case of the Fire habitat. Since it can hold 3 dragons once upgraded, you might as well put your Smoke (Wind/Fire) and Bee (Fire/Wind) dragon in there with it. That will help you keep the number of Wind habitats down, letting you build better habitats instead. Though very early on it makes sense to build “temporary” Fire and Wind habitats, as you can fill them up with dragons very quickly. It can give you a good jump start. Then once you have better options available, sell off the temporary habitats and dragons. If you get any limited dragons, or Gameloft adds new dragons, the requirements could be affected. If you level up your “team” right, fighting will be the largest source of income through most of your levelling. Side quests will open up each day, and the fight quest will allow you to get another 16 side quests each day if you are careful not to trigger any of the other daily quests. Getting stars (for the first time) on each map point gives huge rewards. The most important thing to do at the start of the game is get your first 3 element dragon with Fire as one of the elements. This is because this will be your first “primary” fight dragon. Focus all your Food on leveling it up, opening Temples for it, and focus your Scrolls on maxing out it’s Fire attack once you’ve opened up the Academy. The most likely 3 element dragons with Fire to get early on are Tribal (with the Starter Pack mentioned earlier) and Prairie (connecting to Facebook). Either is a good choice. Fire will allow you to attack all opponents at once, and Wind will allow you to attack one dragon and reduce the damage of the opponents. You probably won’t want to use Earth for attacking or for shielding except in very rare cases. Long term you won’t be using either of these dragons, but you will need lots of level 30 dragons no matter which fight team you eventually go with. So getting your first attack dragon to level 30 ASAP is a good idea. All your Food should be going towards that purpose. A level 30 dragon will get you through most of the 4th island. That’s going to be a lot of Food and Gold! 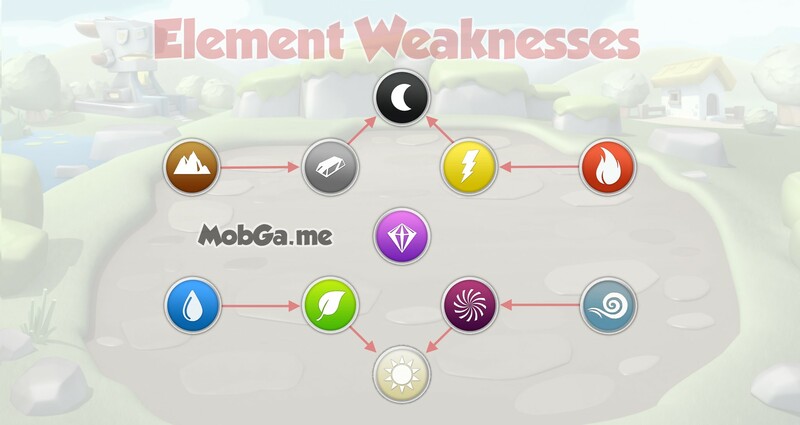 Get to know the element interactions, so you can choose the best attacks to use. The first element of a dragon is it’s primary element, and determines which attacks will be weak, normal, or strong against it. Even though it’s not as important to know about if you go with 1 primary dragon over 3 even levelled dragons, knowing this will help you spot the rare cases where you won’t just want to attack with Fire, and also help you choose which dragon to be the main target of your Fire attack. Dragon Mania Legends allows you to have 3 dragons on your fight team, but that doesn’t mean you should have all 3 dragons levelled up evenly. With how Food requirements are for levelling up dragons, and how the levels of dragons in the side-quests are determined, it actually makes the most sense to focus as much of your Food on 1 dragon as you can. If you care about being able to finish the Dungeons (nice, but not necessary) you can have a secondary dragon which trails the primary dragon by about 10% to 20% of the levels. So you might have a level 50 primary, level 40 secondary, and then a bunch of level 30’s which were necessary to open up the Temples. The primary can easily take care of the tough Dungeon fights, and the secondary + 2x level 30’s can handle the easy Dungeon fights. Fire or Light: These elements allow attacking all 3 opponents at once. Since your dragon will be 5 to 10 levels higher by focusing all your food on it, you will be able to “1 shot” opposing teams that you would have difficulty beating if you had levelled up all 3 dragons equally. But you can only do that if you have an attack which hits all 3 dragons. Plant or Shadow: These elements do good damage to a single target, and add a DOT (Damage Over Time) that will do more damage to that target. Fire also has a DOT (Slow Burn) that can be added at level 6. These are the attacks you will want to use against really tough targets, like Bosses or PvP teams which have also focused their food on one dragon. EDIT: With the v1.8 changes, Shadow and Plant have both become more powerful in most cases. Frightened Speechless appears to proc more often, and Infection spreads at the power of the attacking dragon. This means that Plant is generally going to kill all 3 of your opponents, which can speed up some fights, but can also be a problem as it can lead to situations with some dragons (like Tiger) not being able to avoid killing one of the opponents with a weak attack. For this reason I would choose Shadow over Plant if possible, as it could mean 1m Gold per day if you get unlucky, and rarely would speed up any fights to have the more powerful Plant. Also in some limited cases like tough Campaign Map fights this change makes Plant less useful than it was. For instance, using one of your low level dragons to put Infection on a tough dragon and then having your main kill it to spread the (very damaging) Infection to the other dragons will no longer work. The Infection will instead still be the power of the low level dragon, rather than the tough dragon it was on. Legendary is great because it increases the attack value of your other attacks and your hitpoints more than any other element. You won’t use the Legendary attack unless you’re fighting tough single opponents which have Light or Shadow primary elements. If you can get a Legendary dragon with early enough, definitely go with it. Only Berry so far has the 3 target attack, and DOT. Siren, Crystal, Pixel, Firestorm, Lantern, Love, and Yin Yang also have 3 target attacks and so could be used. Energy is great to have because it will remove buffs on the oppenent’s team, while still hitting 2 or 3 of their dragons. It’s also a nice fall-back option if you are relying on Fire for damage, and run into a team with 2 or 3 Fire based dragons. Also, it has a good attack modifier, which means your other attacks will be stronger than with most other elements in this slot. Wind is good because it will allow you to reduce the damage of the opponent’s dragons. Generally though you won’t use this, but it’s nice to have. Void is nice since it will heal you while you attack. You’d only really use it if up against a strong single opponent with Plant, or if you just need a few more HPs to make it through the fight. Again, any 3 element dragon with Fire can be your primary until it’s level 30. It will help with Temples for your long term team anyway. You could use a 2 element dragon with Fire. It will be a little bit faster to get to level 30 due to not requiring as many Temples, but isn’t as strong a fighter and doesn’t count as much for Temples, costing you more in the long run. The amount of Food necessary to get a dragon to max level is huge, so making sure you get the right dragon(s) is very important. Rocker: Highest attack of any non-Legendary dragon, with Fire for AOE/DOT and Shadow for DOT. Energy for Burnout is also helpful. Breedable, but available late in the game. Berry: Legendary primary element so nothing can hit strong against you. Fire for AOE/DOT, Plant for DOT. Has only been available as a Dragon of the Month (May 2015). Stardust/Meteorite: Both these dragons cover the AOE with Light and the DOT with Shadow. This also gives them 7 elements which they can hit for strong damage against (Wind, Earth, Energy, Plant, Water, Fire). Void isn’t great, but can be situationally useful. Stardust is breedable, but available late in the game. Meteorite has been available through events only. Meteorite may be a bit better long term, as many fight teams will eventually end up being 3x Legendary dragons, and so Stardust’s Shadow primary element could be a weakness in that regard. Still you can’t go wrong with either for your fight team. Tiger/Mutant: Both these dragons have Fire for AOE/DOT and Nature for DOT. Both have Energy which is useful for burnout and helps keep their attack near the top of the list of dragons. The problem with both is their element weaknesses. Tiger takes extra damage from Light and Void attacks, Mutant from Shadow and Metal attacks. This probably gives Mutant a slight advantage over Tiger, as it won’t be hit for strong damage by the AOE targetting your “other” dragons. Tiger is breedable and Mutant is event only. So most would use Tiger simply because it’s available. Note: There are many other dragons with an AOE and DOT attacks, such as Bronze (Light/Metal/Shadow) or Orange (Fire/Plant/Earth). They have lower Attack values though, so you’d be better off using one of those above. Any Legendary dragon with Light or Fire is also a good option. You won’t have as good of a DOT for single targets, but will have more HPs in most cases. If a Legendary/Light/Shadow or Legendary/Shadow/Light dragon is released, it will be the best dragon in the game. I love using my friends’ level 70 Tiger dragons to one-shot 3-star Heroic map points. It will do in most cases through the Shadow Island, and even some of the Light Island. My level 54 Tiger served me well in PvP, and I even won a Warlord with it. So you definitely don’t need the absolute best dragons at highest level to do well. An addition with the v1.5 update, Daily Missions now can be done every 24 hours. They consist of doing a series of tasks to earn trophies, and once you get 8 trophies you will get a piece of a puzzle. Dragons, Gold, Food, and Gems can be won when you complete the puzzles. Cookie, Kangaroo, and Piggy Bank are the dragons that have been verified as having puzzles so far. You always want to do the Divide and Reconquer quests 16 times. This is because 2 side-quests on the fight map will be opened up each time it refreshes those quests. This means you get to fight 16 more side-quests and get all that Gold and Food! Check to make sure you’ve cleaned up all the side-quests before doing the Divide and Reconquer, so as to avoid a situation where one of your already-opened side-quests gets chosen as a side-quest for the Divide and Reconquer. You want to be able to fight as many side-quests a day as possible!